We present a new data structure for encoding the appearance of a geometric model as seen from a viewing region (view cell). This representation can be used in interactive or real-time visualization applications to replace a complex model by an impostor, maintaining high quality rendering while cutting down rendering time. Our approach relies on an object-space sampled representation similar to a point cloud or a layered depth image, but introduces two fundamental additions to previous techniques. First, the sampling rate is controlled to provide sufficient density across all possible viewing conditions from the specified view cell. Second, a correct, antialiased representation of the plenoptic function is computed using Monte Carlo integration. Our system therefore achieves high quality rendering using a simple representation with bounded complexity. 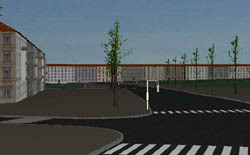 We demonstrate the method for an application in urban visualization.